Seed Pack Description Dried beans pack a load of protein, fiber, vitamins, minerals - and flavor - into their colorful and long-lasting seeds. No wonder they're classic staples of gourmet restaurants, farmhouse kitchens and cowboy line camps from coast to coast. For “Preparedness Gardening” you cannot beat drying beans for nutrition, easy growing, and amazing storability for long-term food security. Seed Pack ContentsThe Heirloom Dry Beans Pack from Heirloom Organics features the most common, easy-to-grow, nutritious varieties of drying beans available. America was built on beans and America will thrive on beans! Pinto beans are excellent for baked and bbq beans and Mexican refried beans. Black beans are a Tex-Mex favorite and Great Northern White beans are some of the best stew bean you can find. Lima Beans are a southern delicacy, while Fava beans and Garbanzo beans, or Chickpeas are Mediteranian favorites. The Heirloom Dry Beans Pack provides a delicious selection of beans which are 100% heirloom, non-hybrid (open pollinated) and non-GMO (genetically modified). For long-term food storage and sustainability, the Heirloom Dry Beans Pack is your choice. Click here to see 7 bean varieties Please place your seed orders on our pages as Heirloom-Organics cannot track clicks from our site to theirs. Seed Pack Description The NEW Heirloom Organics Fruit Lover’s Pack is absolutely overflowing with flavor, nutrition and health. You get the same succulent, juicy Watermelons and super sweet Cantaloupes & Melons we have always provided, but now we have added 2 super flavorful, easy-to-grow Strawberry varieties, America’s favorite Huckleberries and Mulberries for pies, desserts and just good eating. And we have added the world’s most healthful berry, the Goji Berry, containing the highest amount of anti-oxidants (anti-aging) of any food on earth! The Fruit Lover’s Pack is now the healthiest, most flavor-packed seed pack you can find! 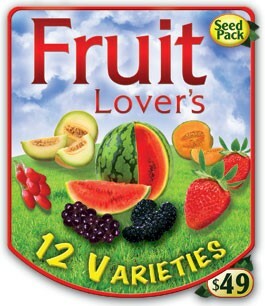 Click the image above to view the 12 fruit varieties. Currently shipping to the US & Canada Please place your seed orders on our pages as Heirloom-Organics cannot track clicks from our site to theirs.